Econet has launched a voice promotion that gives its subscribers unlimited voice calls to other Econet numbers for just $1. 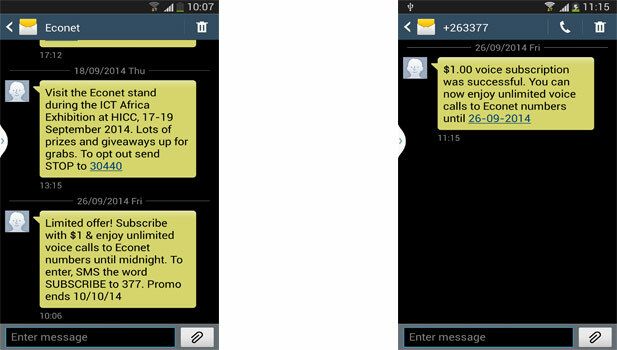 According to an SMS being circulated to subscribers this limited offer is valid until the 10th of October 2014 and the $1 recharge gives a subscriber unlimited calls until midnight. To enter you have to SMS SUBSCRIBE to 377. 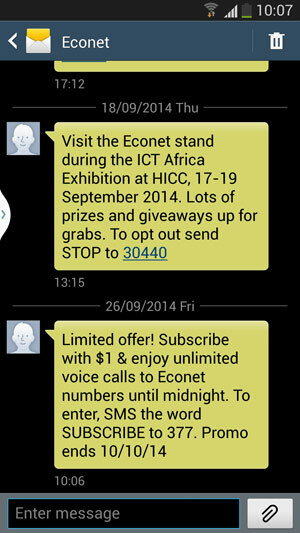 A similar SMS(complete with the same 377 subscriber number) circulated a while back although Econet denied their involvement in such a promotion at the time. This is probably the most generous and disruptive voice call offer Econet has made, highlighting the efforts that the network like its competitors is making in capturing value from falling voice revenues. Although it has been given a short life span(hope they extend it, fingers crossed) it’s market changer as well, considering that Econet has the largest subscriber base. Its also a great deal for a typical small business or startup that can communicate with the majority of its contacts for just $1 a day. Until this promotion is cancelled we can expect a huge drop in off net calls to Telecel and NetOne. Recently Telecel re-introduced its Mega Juice promotion which gives prepaid subscribers 100% bonus for on net calls whenever they recharge with airtime worth $1 or more. NetOne has stuck with its successful and never ending $1 a day promotion that offers unlimited calls to NetOne numbers from 6pm to 6am for a $1 recharge. Econet has stated that it is no longer competing on price, but rather focusing on boosting subscriber value. If that is the case then this won’t be a response to Telecel’s generous voice offers, but Econet’s own efforts at making the most of voice services that are losing relevance to data options. Thanks to communication alternatives like instant messaging, specifically WhatsApp, mobile subscribers can avoid steep voice call tariffs. This scramble to get people to call more is definitely a good thing for subscribers though. Who would have thought $1 would get you so much talk time from Econet anyway? Econet has gotten in touch with us and said that this promotion was a test and has not been opened to all its subscribers. They should just roll all these things into a single bundle now – since they seem to be liking subscription model. ECONET!!! WAKEUP! !… What do you mean TEST!!! We are tired of your thieving seriously.. I don’t like telecel but you are forcing my hand… JACK-UP or We Will Leave You… I SAID IT TODAY. Just tried it. Its not working. this promotion is a test for sure, i have tried it and i get the message “You cannot subscribe to this service at the moment”. I guess maybe it was made for certain users on the network and not open to all subscribers. Got the message yesterday and I subscribed and spoke for my sister for a whole hour all for a dollar with all that we complain about it was amazing. “NetOne has stuck with its successful and never ending $1 a day promotion that offers unlimited calls to NetOne numbers from 6pm to 6am for a $1 recharge.”??? am I the only one or that statement is not accurate? I think the unlimited call on the NetOne network are now from 10pm to 6am (changed from 8pm to 6am).